He'd also grown his hair long so that it fell in his eyes now, covering his forehead, but that was more necessity than Isabelle. Clary made fun of him about his new look; but, then, Clary found everything about Simon's love life borderline hilarious. OMG, I am SOOO excited this book is finally here! It's been a super long wait. Who else is starting this today?? Unfortunately, I haven't been too interested in this series and haven't read it. I keep hearing it's good, but I just don't want to pick it up for some reason LOL! I hope you're enjoying it though! Ooooh great teaser! I am still waiting for my copy to arrive. Where She Went and Red Glove arrived today but no CoFA. I honestly haven't read this series. Kind of in the same boast as aLmYbNeNr! I really need to read this series. I have heard such good things about it. My teasers are from The Demon Kiss by Lacey Weatherford and Breaking the Rules by Suzanne Brockmann. Happy reading! As soon as I am done work today I am running to a bookstore to grab my copy. It's going to be a LONG day at the office. Happy reading! Aw! Hope you enjoy it! Oh, you're so lucky! I probally won't get to read it until my library receives it (good thing is my Mom is the librian, so I'll get first dibs lol). Totally wrote a comment a few minutes ago, and I think Blogger ate it! GRR! Glad I'm not the only one, Jessica! Mine hasn't even shipped yet darn B&N!!! 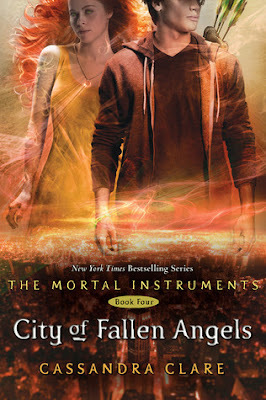 :( I think when I get out of work I will be buying it for my Kindle though because I can't stand the wait!!! I'm heading to a bookstore right now before school to grab a copy :) Can't wait! I'm so excited to read this book. I can't wait for it! i havnt even started the series lol. bad me. I;m really excited to read too... thanks for the teaser. This comes out today doesn't it? I'm so excited! Arghhhhhhh!! *sighs* I want my Jace again. Can't wait for COFA!!! I haven't let this one drift far from my clutching hands since it came yesterday. Reading it has been like sinking into a dark hole where there's only me, CoFA and enough light to read by.